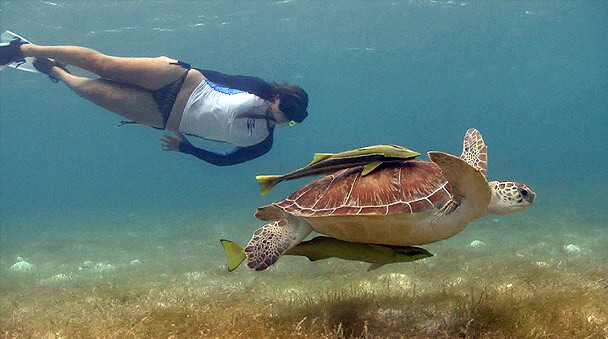 A great half-day excursion to beautiful Akumal Bay, where youll have the experience of a lifetime as you snorkel with sea turtles, swimming freely in their natural environment, youll be amazed! Get to snorkel with marine turtles in Akumal, were the second largest reef in the world is located and get to discover the sacred waters of a marvelous Cenote. Akumal, means Place of the Turtles in the Maya. Akumal is located 100km (62 miles) south of Cancun in the heart of the Riviera Maya. In the natural protected area you get the opportunity to snorkel and enjoy the amazing Marine Turtles and the very colorful fish at the second largest reef in the world. The marine turtles come really close to the beach of Akumal and you get the chance to see them really closely. To complete the adventure you will discover and explore unique cenotes and snorkel in its crystal clear waters. Cenotes are underground rivers, which show the unique water systems of the Yucatan Peninsula! You will see the roots of the trees hanging in the water, that take the water from the Cenotes. 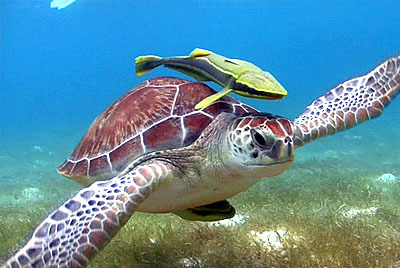 During this tour you really get the chance to immerse yourself in the sealife of Akumal, Mexico! Come and make this experience a memory for a lifetime! 9:00 AM - Go Snorkeling in a Cenote and enjoy crystal clear waters and amazing formations. 10:15 AM - Snorkeling in Akumal, a natural protected area where the Marine Turtles are very close to the beach, here you will get the chance to enjoy the marine turtle observation with explanation of your guide. 12:30 AM - Transfer back to your hotel by our comfortable vans. 2:00 PM - Expected to Arrive back at your hotel in Cancun (1:00 pm Playa del Carmen).